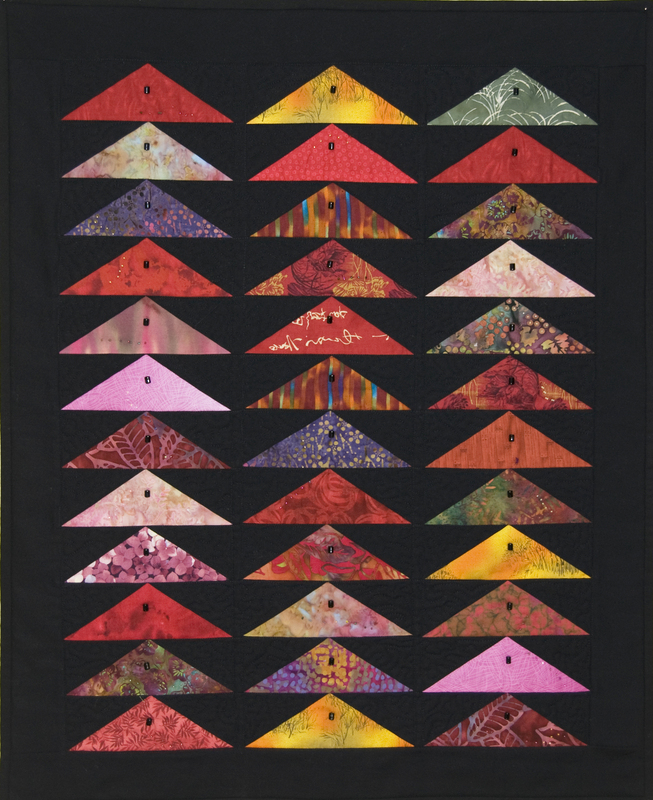 Red Asian Geese measures 28 by 35 inches. 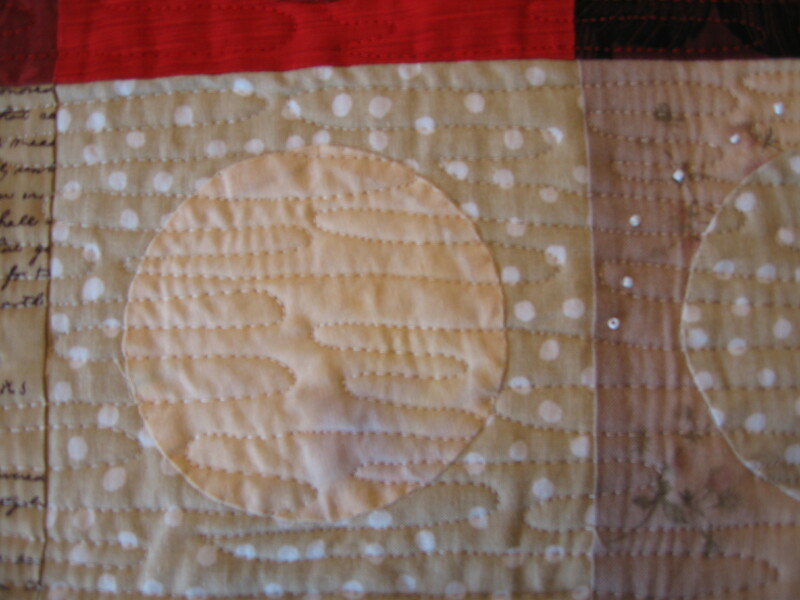 Brown Geese measures 28 by 35 inches. 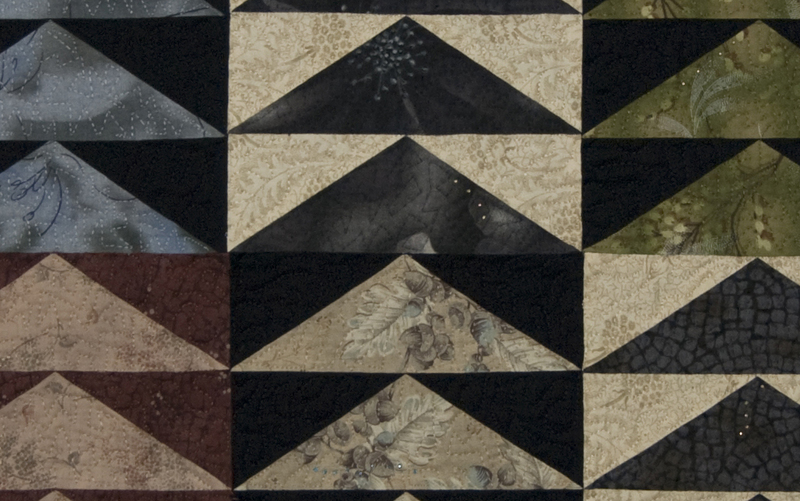 It is composed primarily of fabrics from the Japanese Serenity Collection of taupes by Daiwabo. 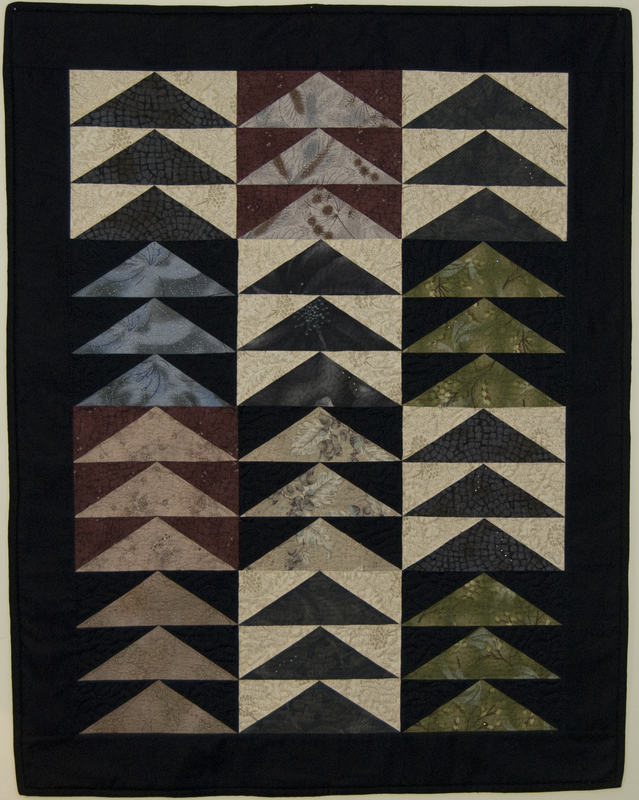 These fabrics are extremely popular and fly off the shelves of quilt shops due to their soft luxuriousness, muted tones, the workmanship of the screen printing, and the unique dyes and color shading which all are a testament to the quality of the fabric. 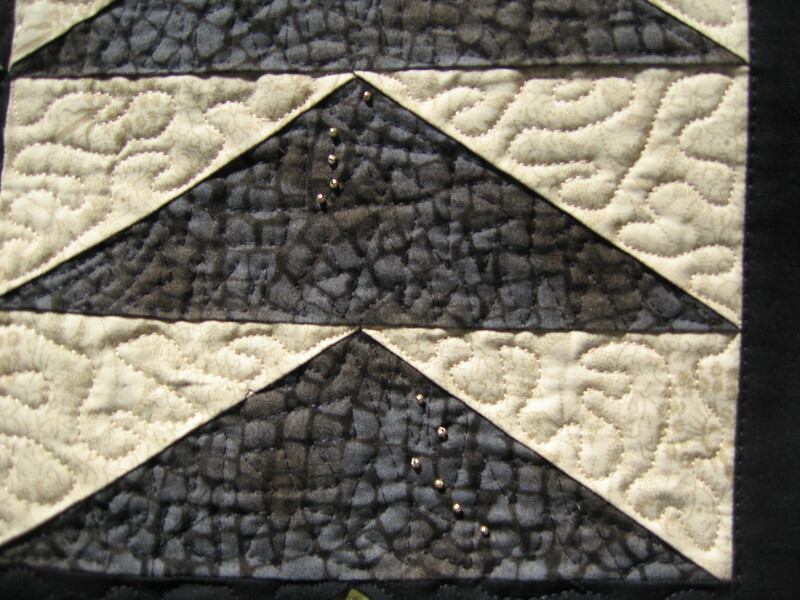 The subtle coloring of this piece will look sophisticated for years to come. 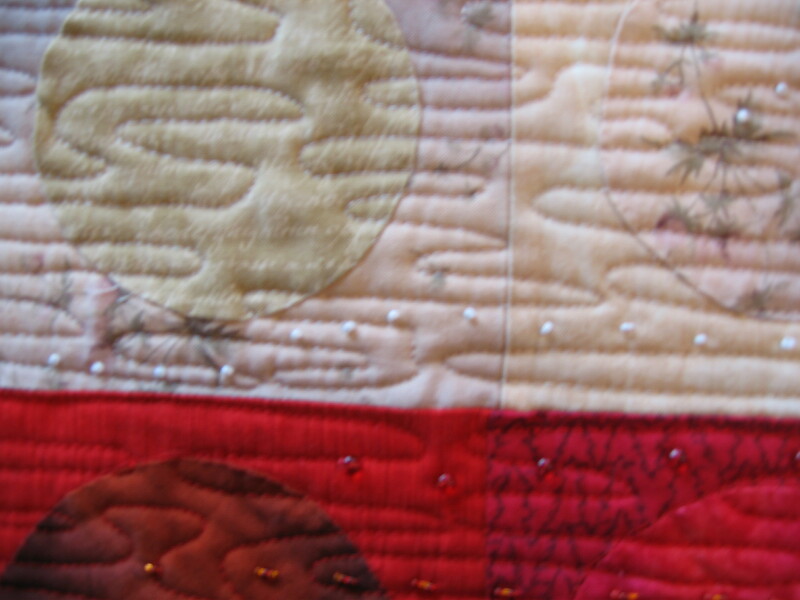 I take pride in my work and the closeup details provide evidence to that fact. 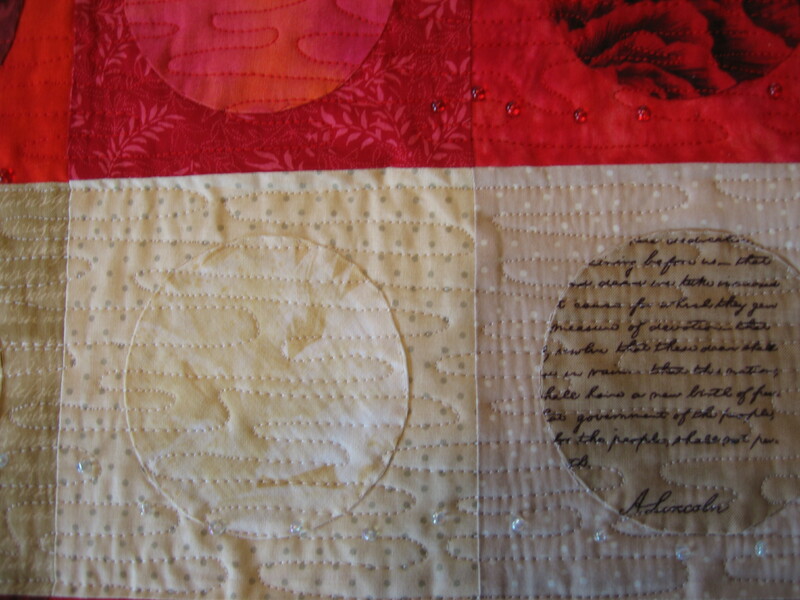 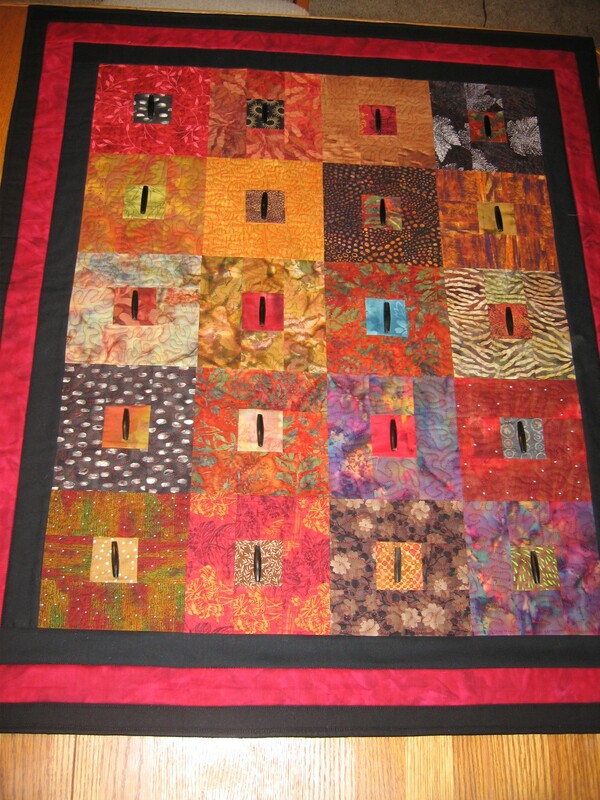 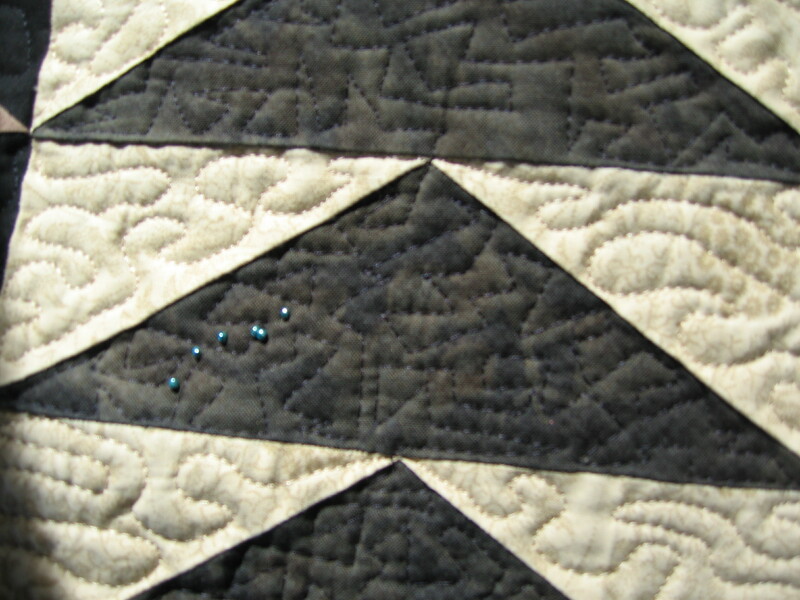 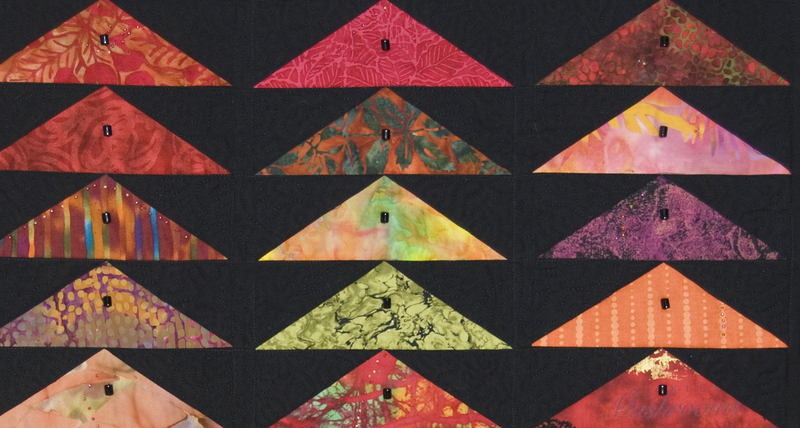 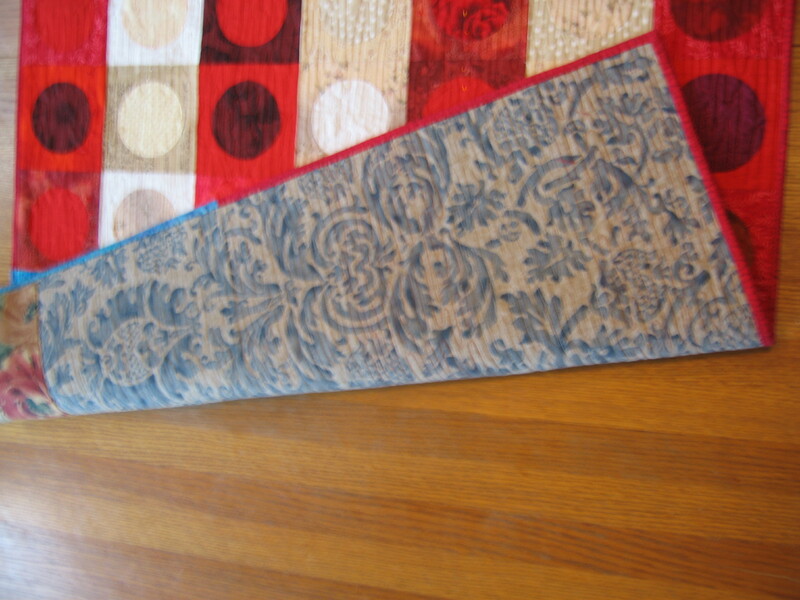 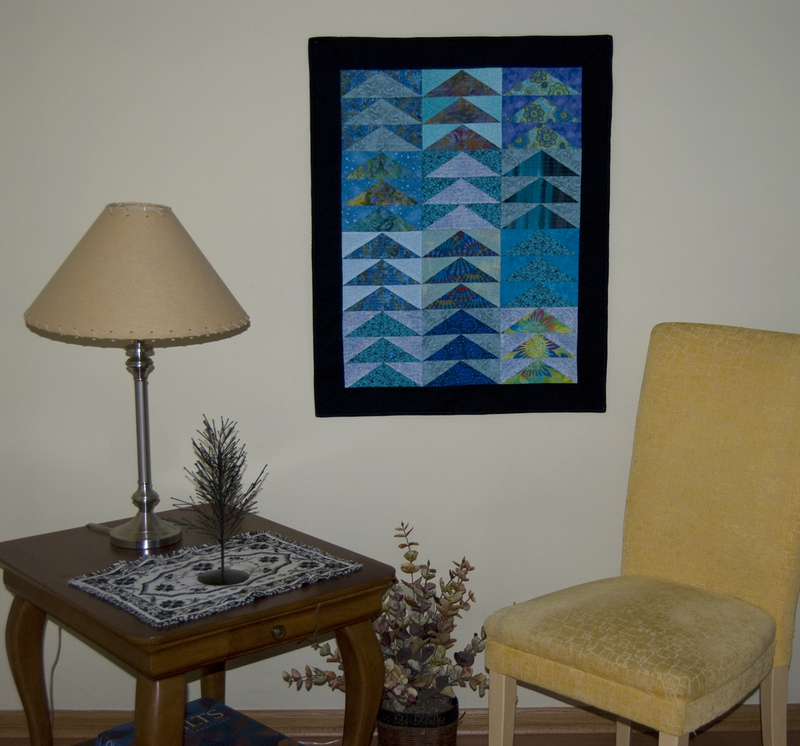 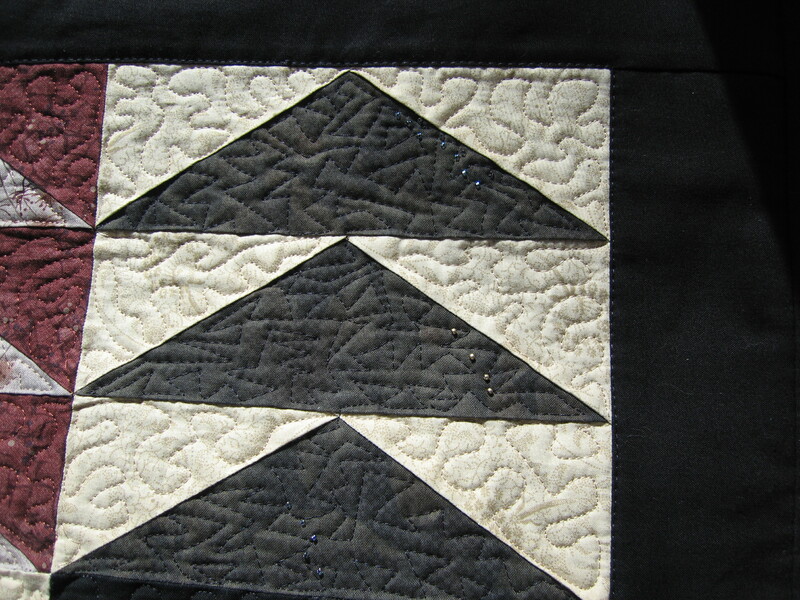 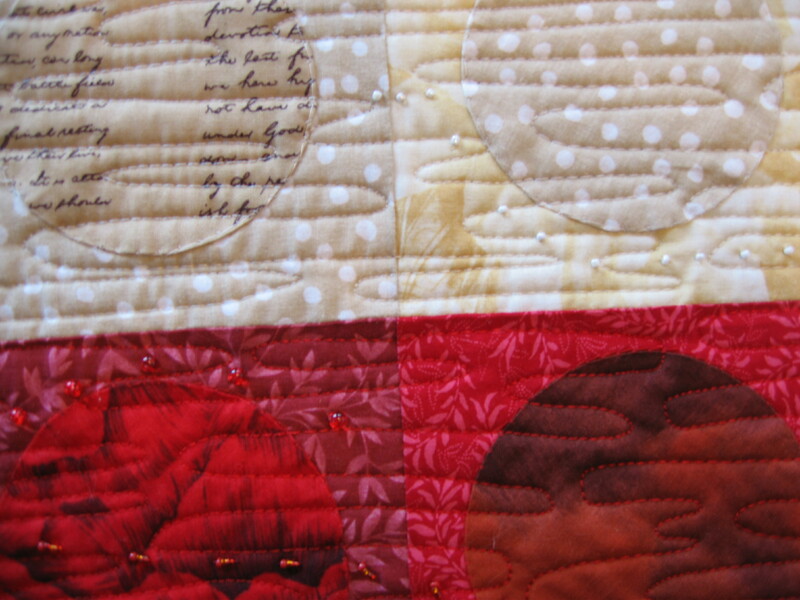 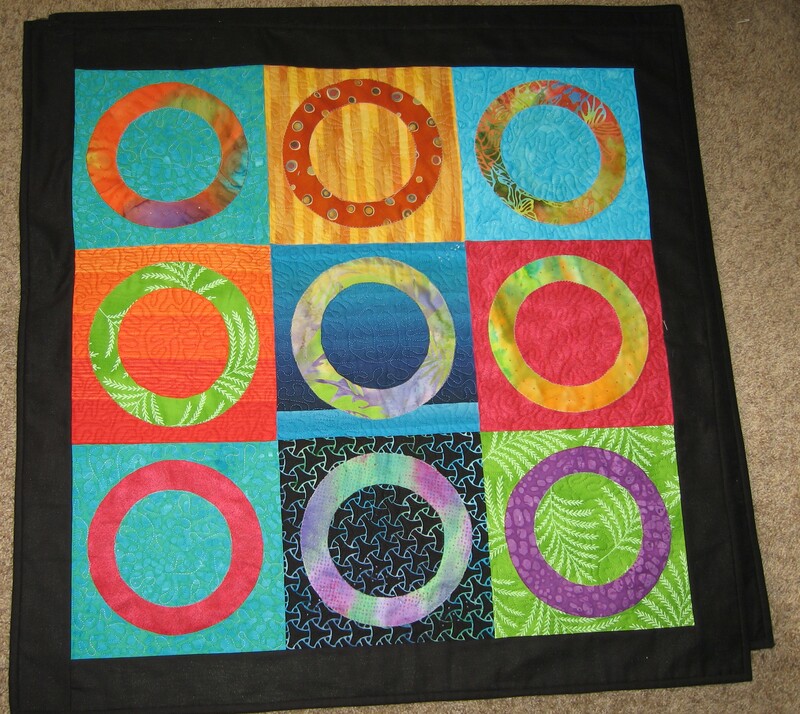 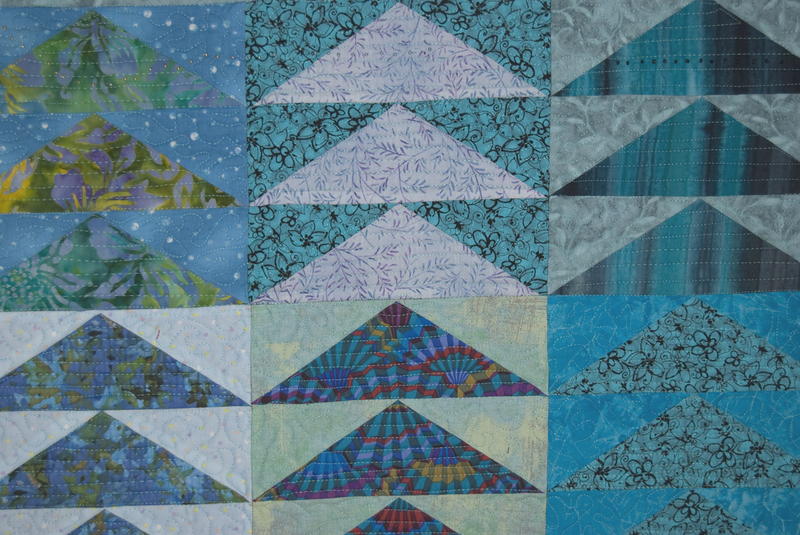 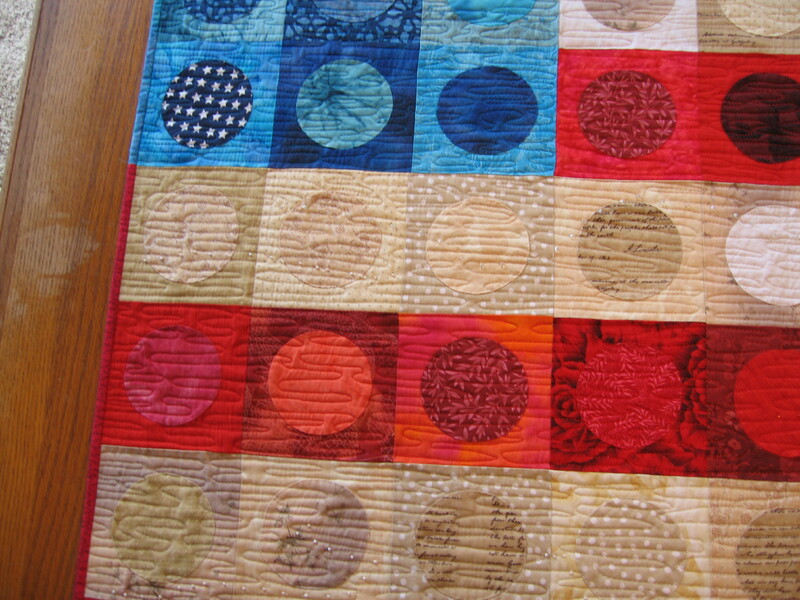 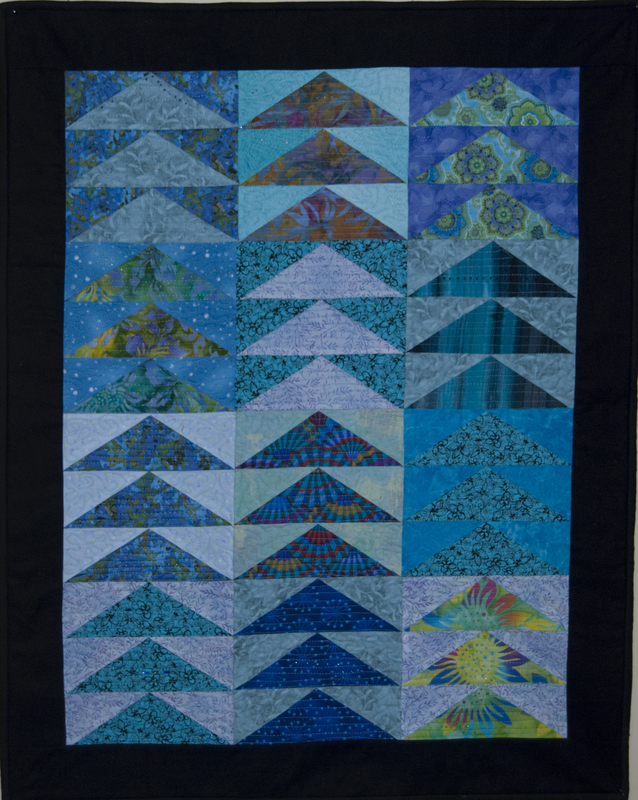 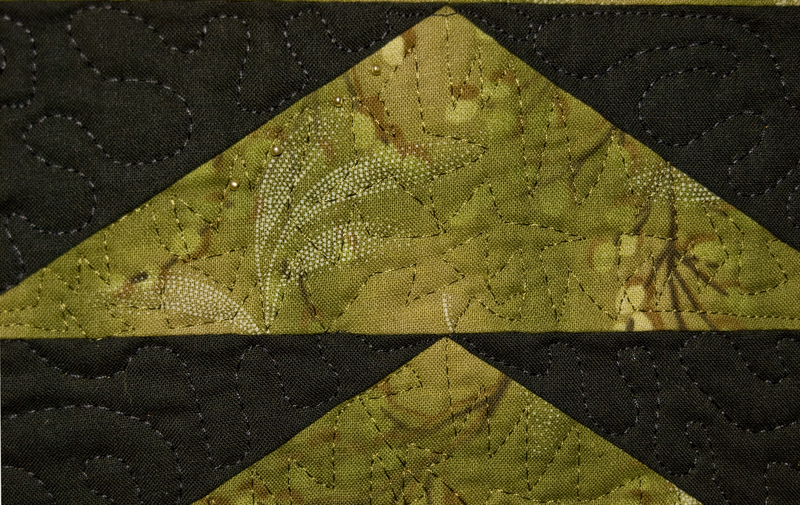 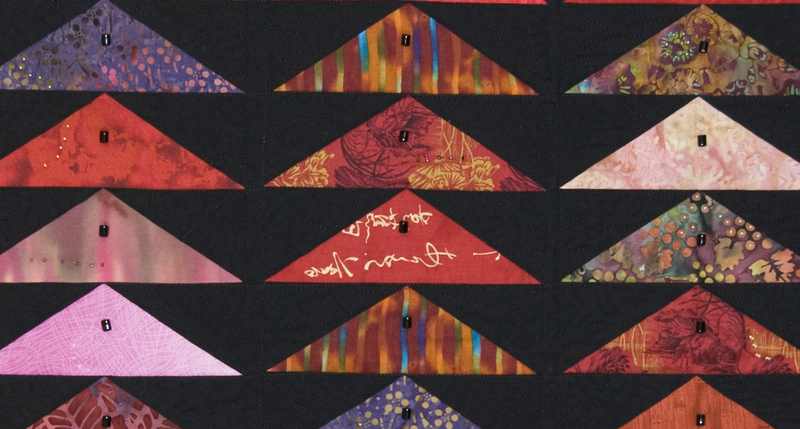 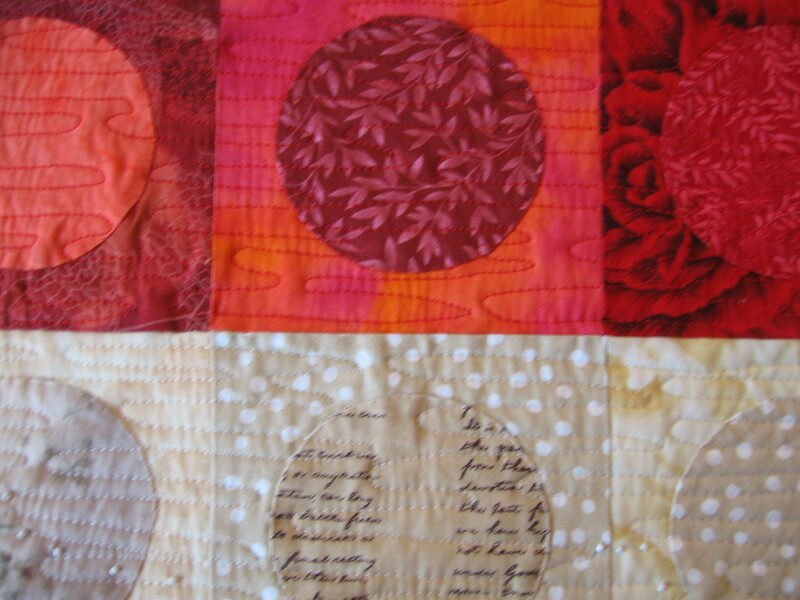 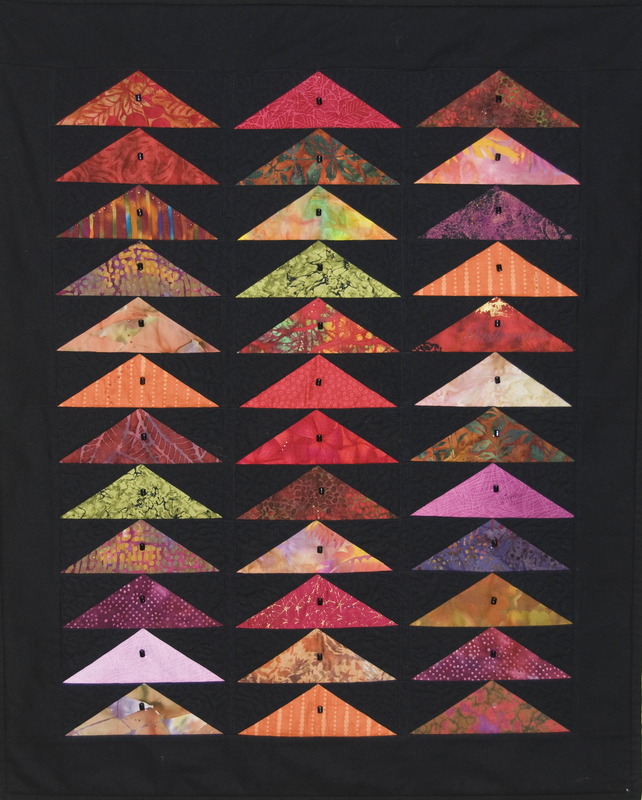 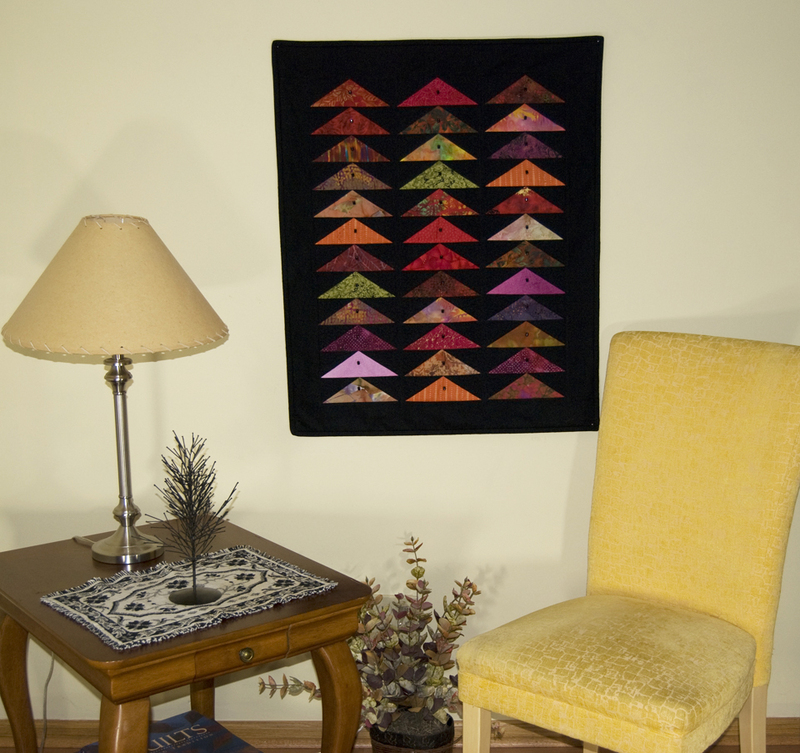 The quilt has a hanging sleeve and simple directions for tips on mounting it on your wall. 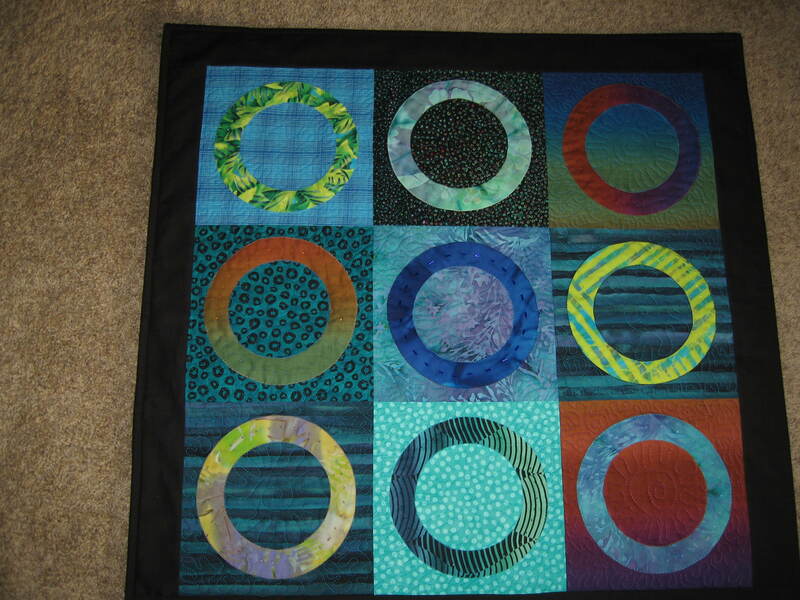 The quilting was done with Sulky brand rayon thread and the beads are a subtle complement with my intention to not overwhelm the calming mood reflected by the design and fabrics. 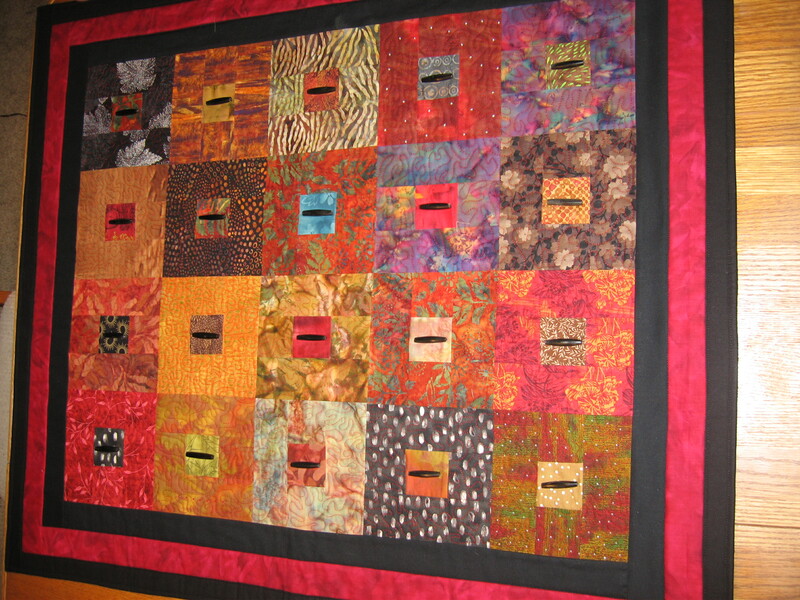 Red Geese measures 28 by 35 inches. 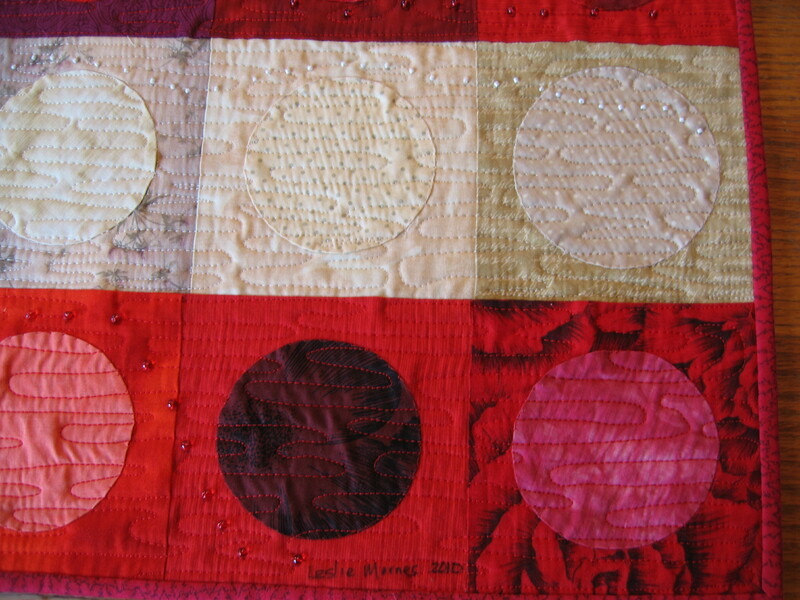 Bead at lower left corner has been replaced after the photo was taken. 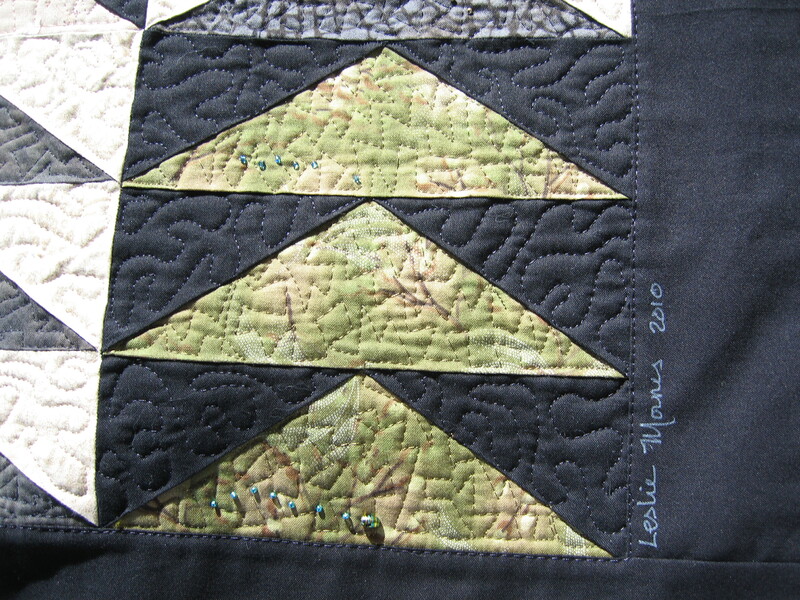 Blue Geese measures 35 x 27.5 inches. 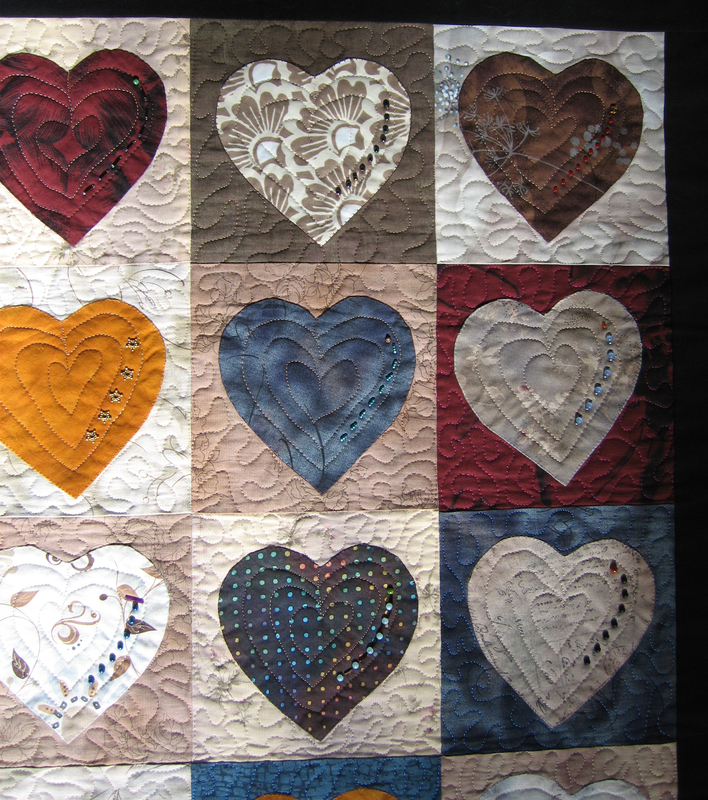 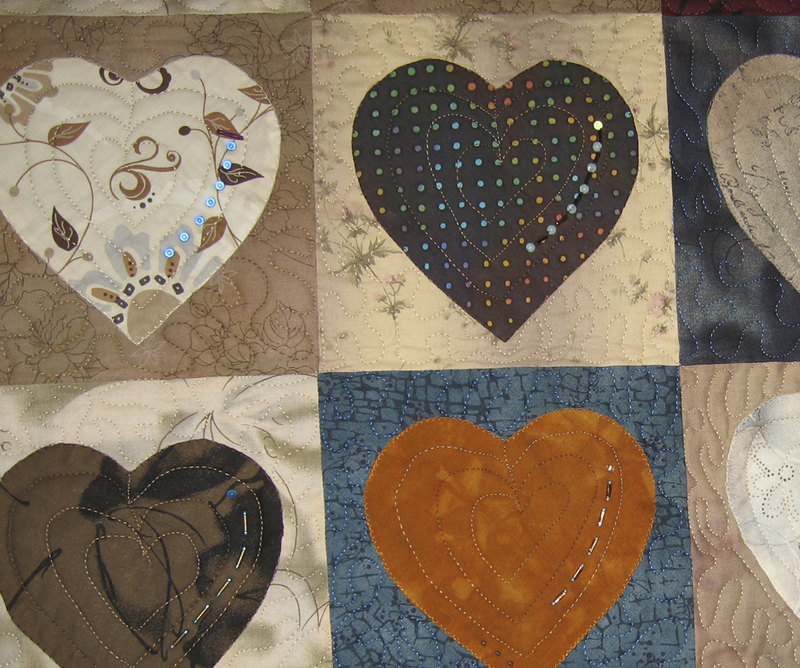 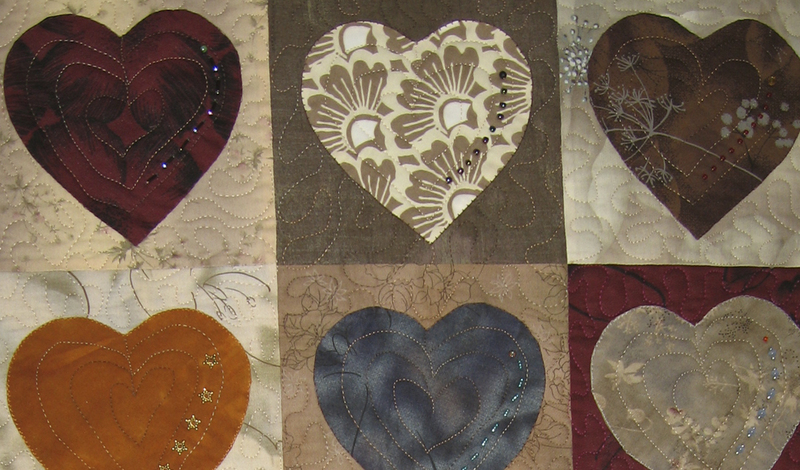 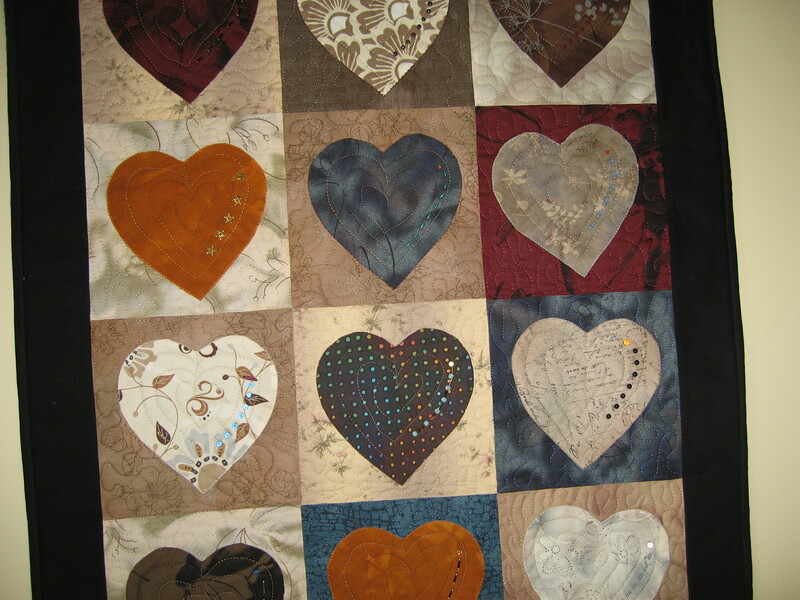 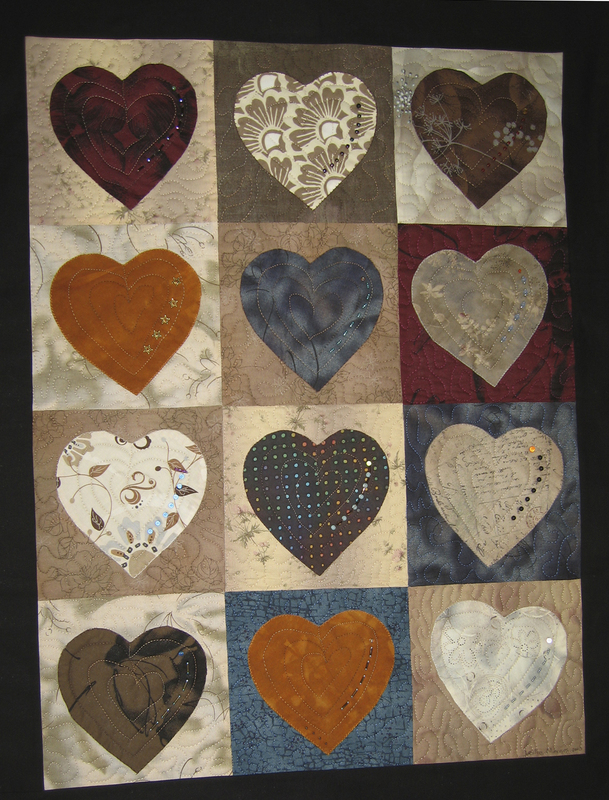 Hearts 2 measures 24 X 30 inches. 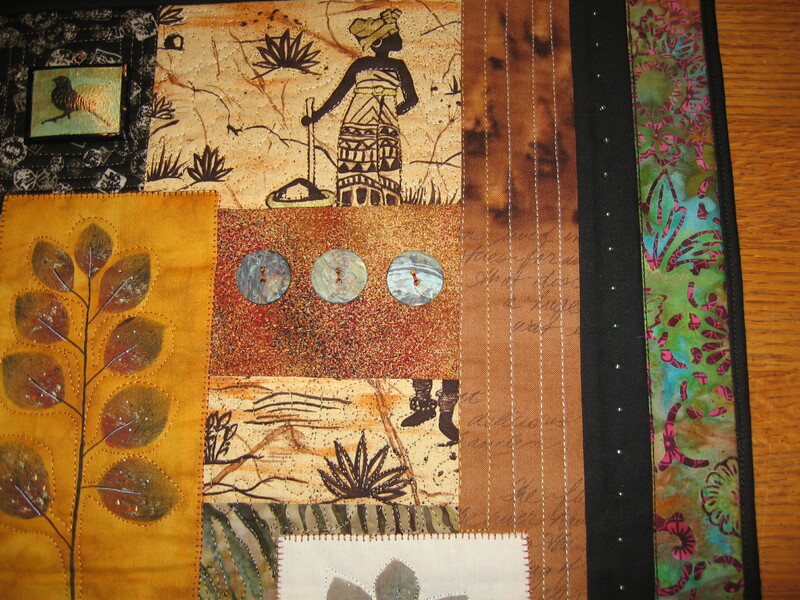 Glory measures 35 by 45 inches. 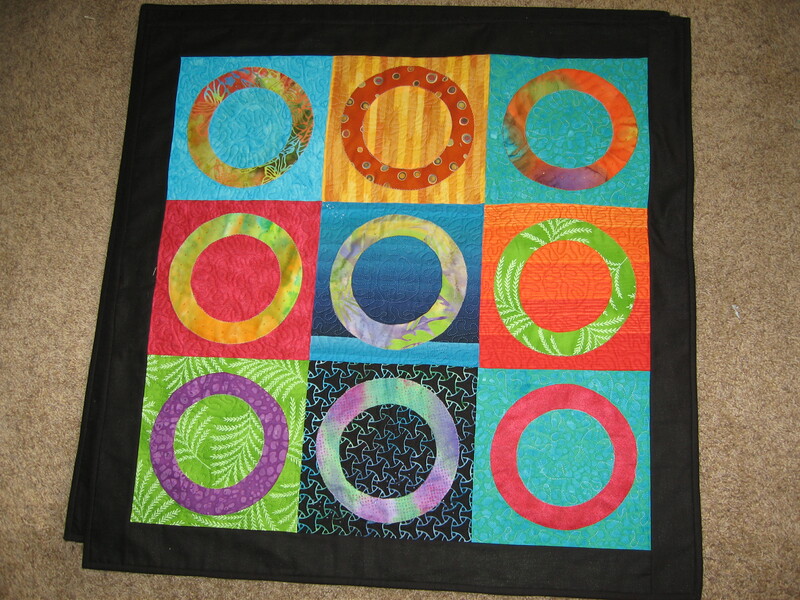 Again with the circle theme. 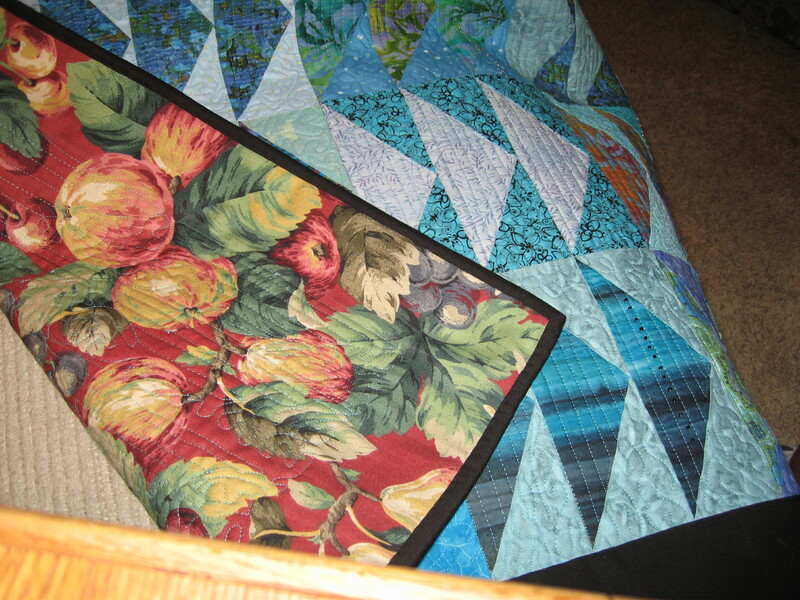 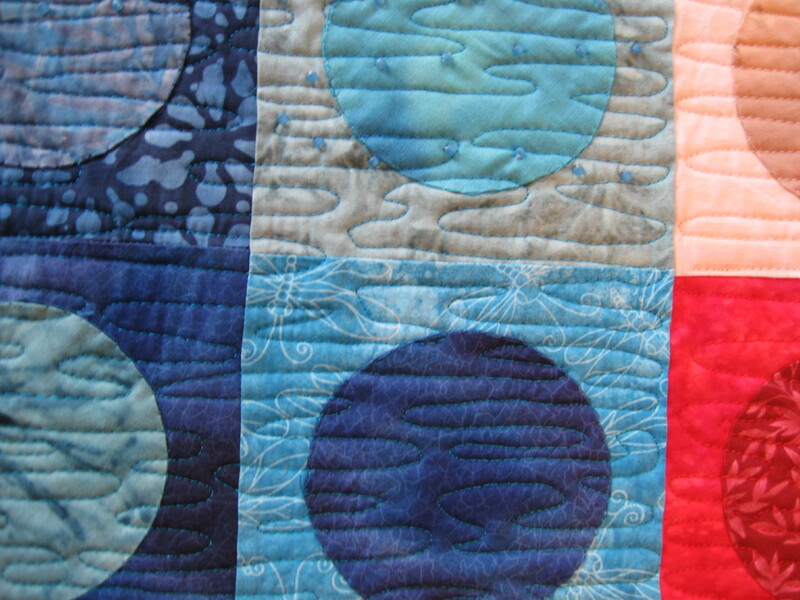 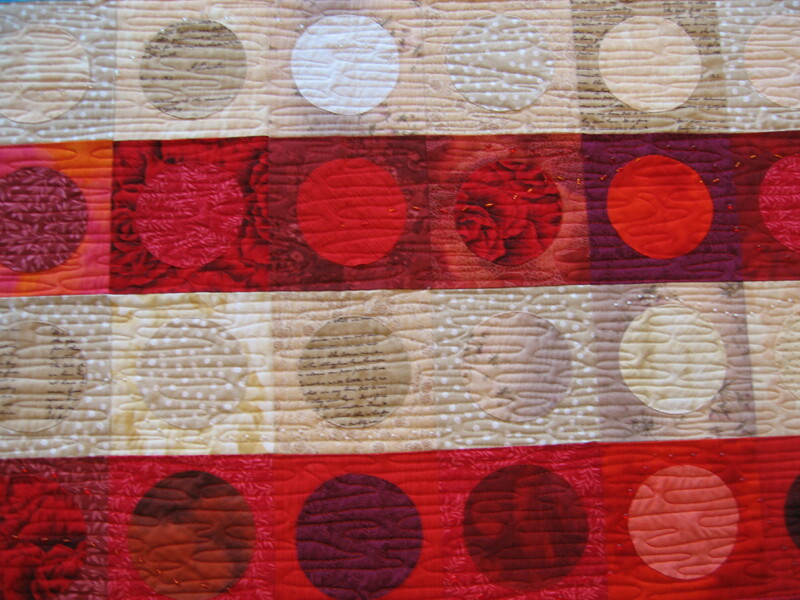 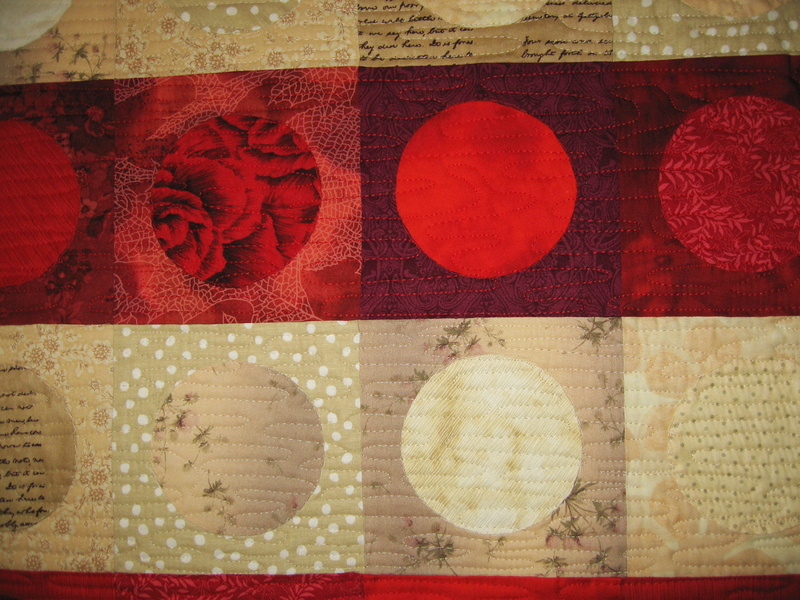 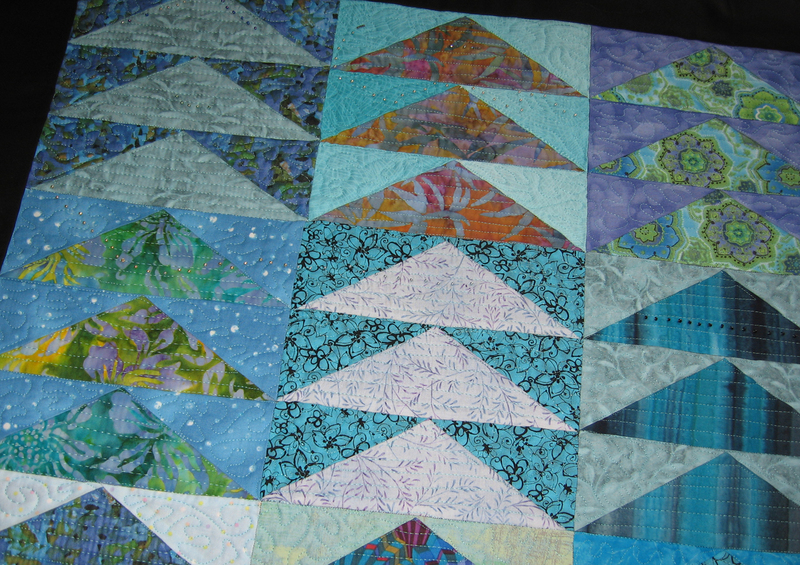 I made this quilt in the summer of 2010. 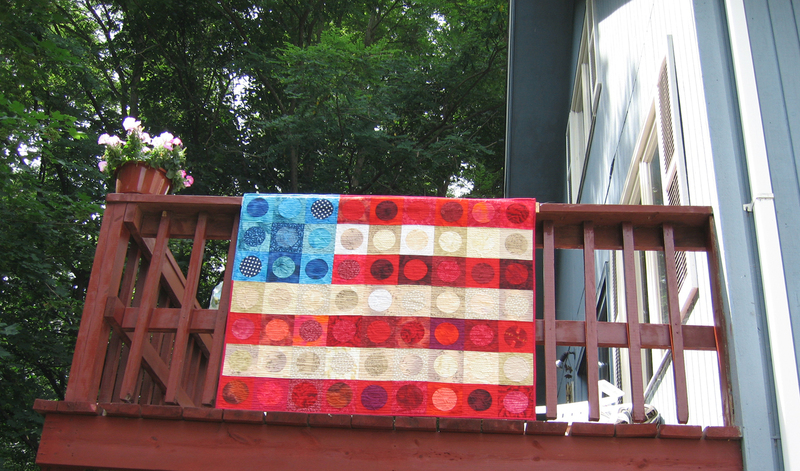 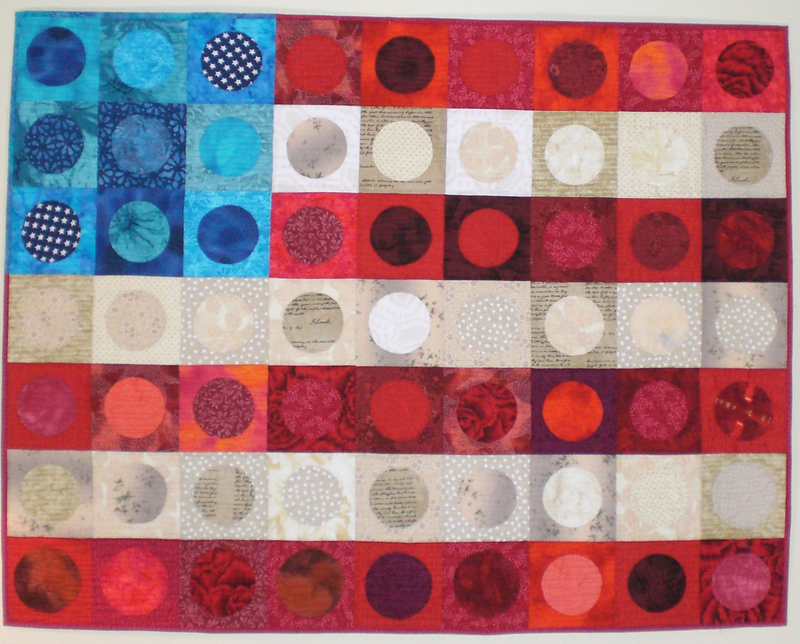 This flag quilt ‘Glory” was an attempt to create a flag made of circles but still maintaining the stripes. 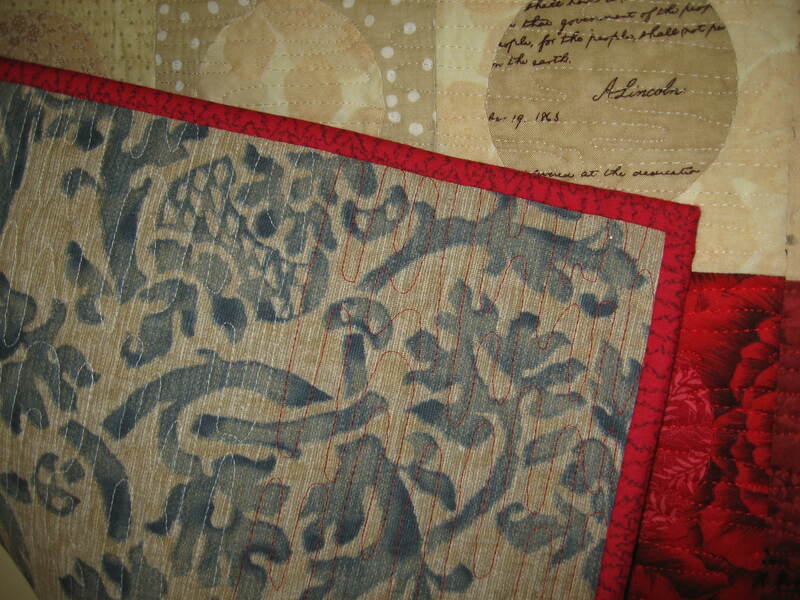 I used several red, cream/white fabrics, and blue that would make a bold statement. 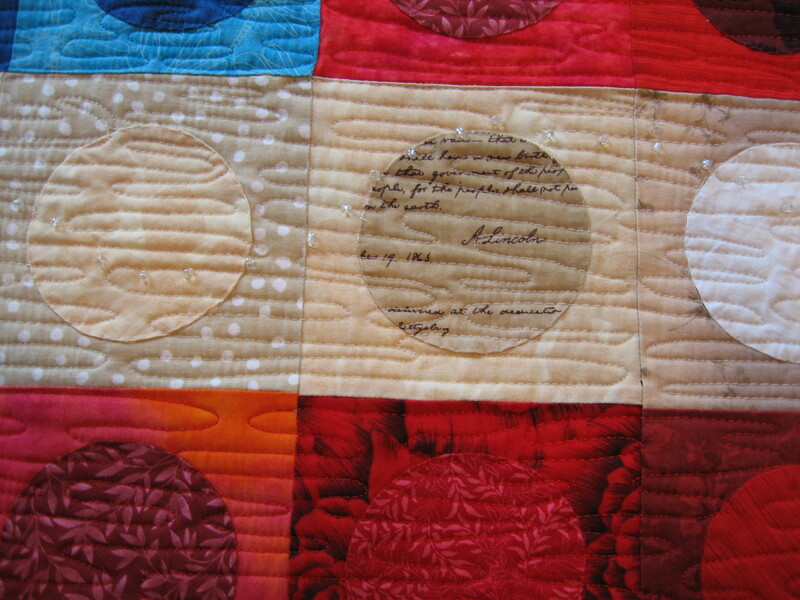 One of the main fabrics is the one with the Gettysburg Address written on it. 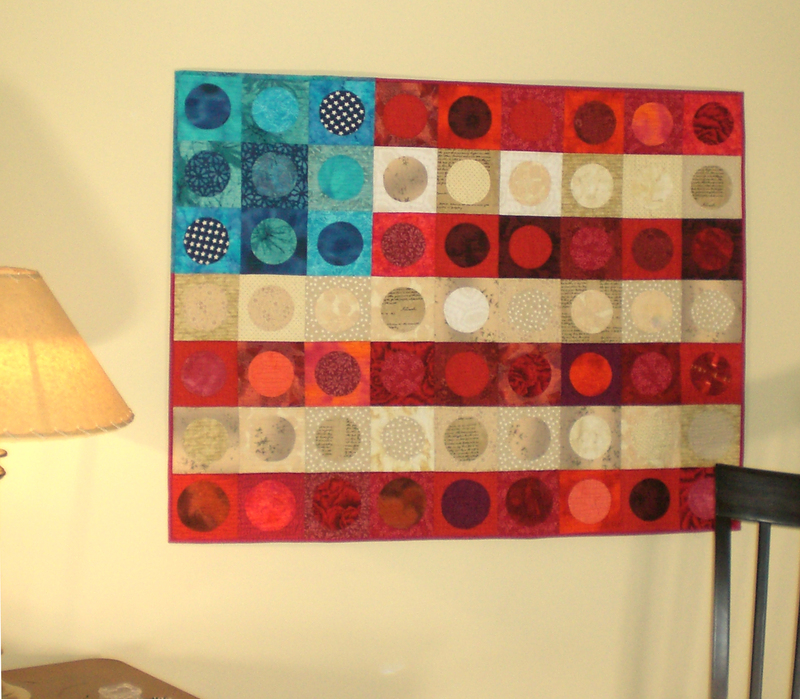 And signed by Abe Lincoln. 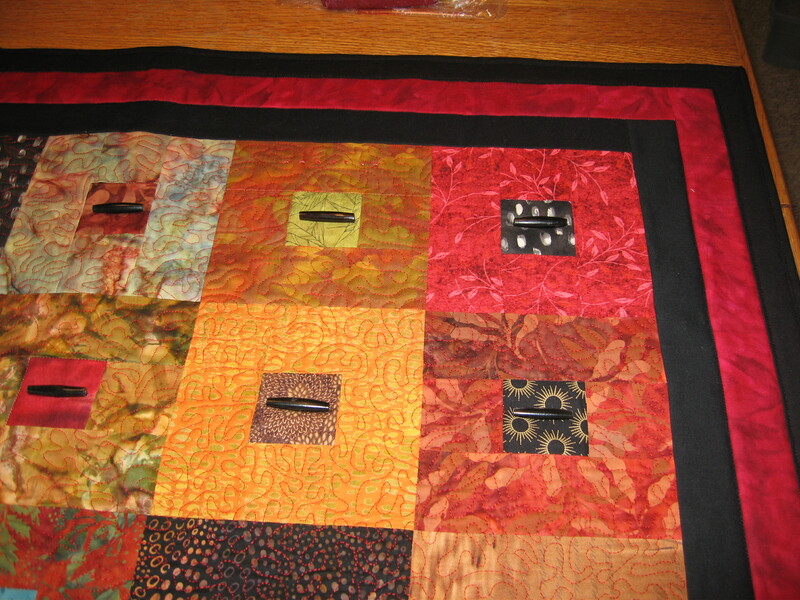 I have added a spattering of beads and quilted it with beautiful rayon thread. 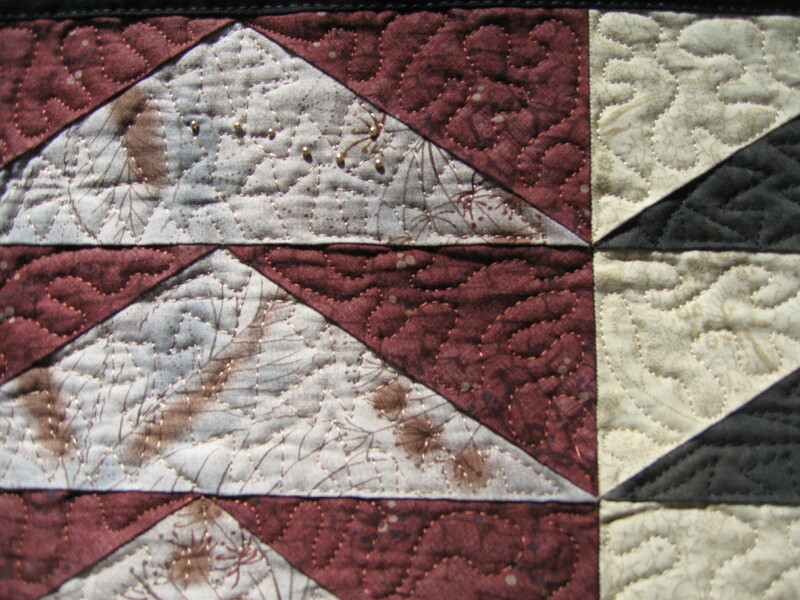 I take great pride in my workmanship and this should be evident from the detailed photos. 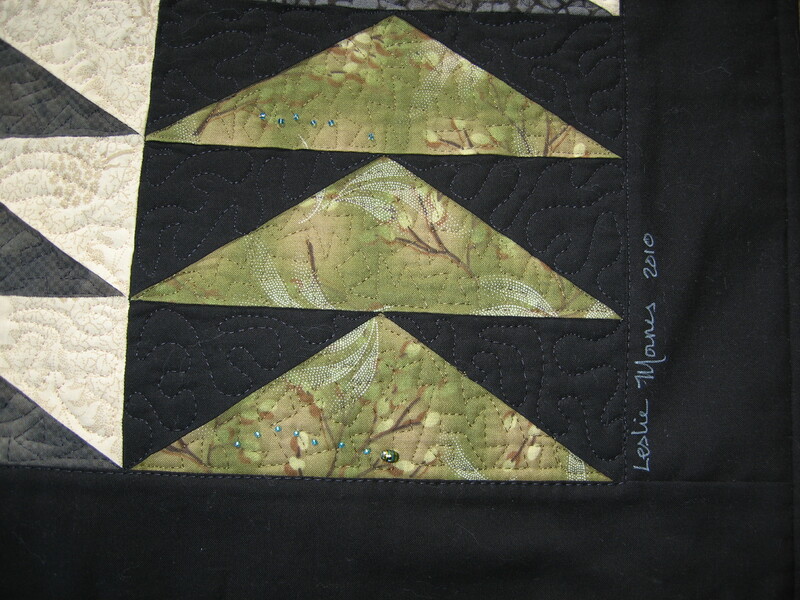 The binding has been sewn on by machine on the front for a smooth even finish, and then hand sewn on the back to avoid additional stitching adding to the front. 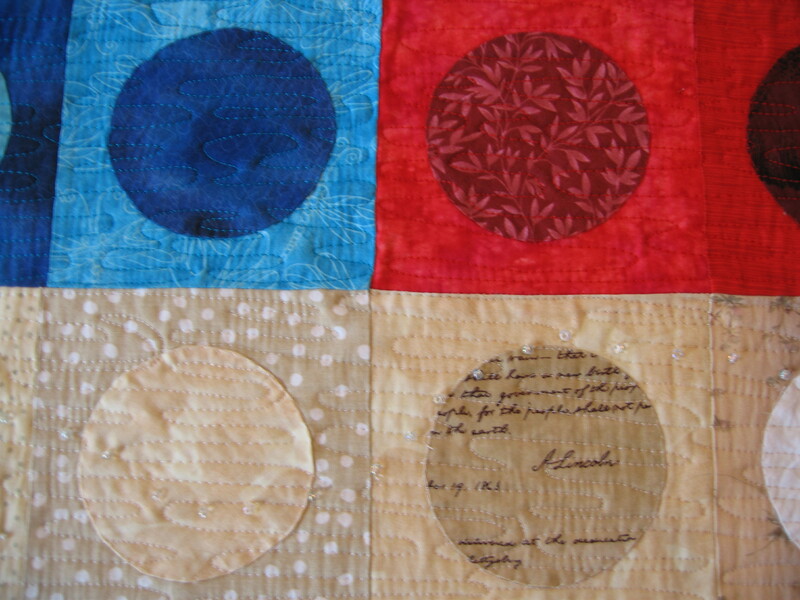 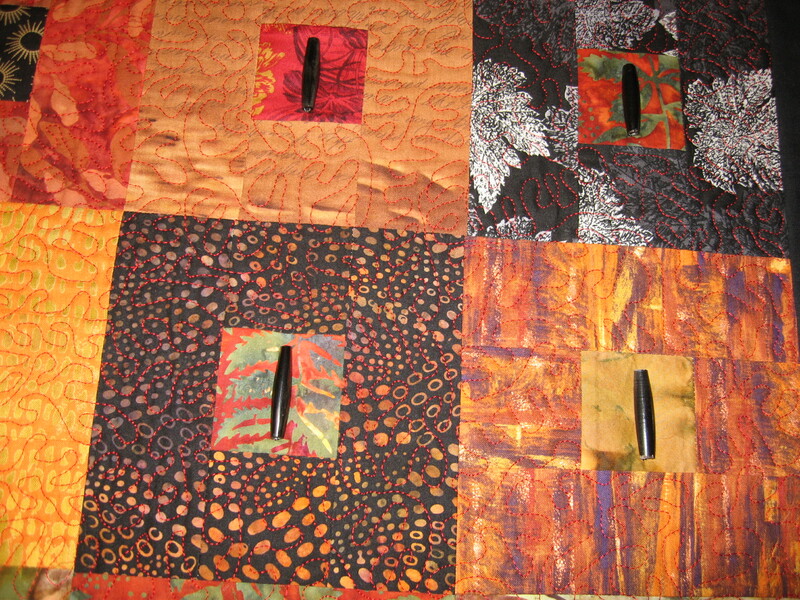 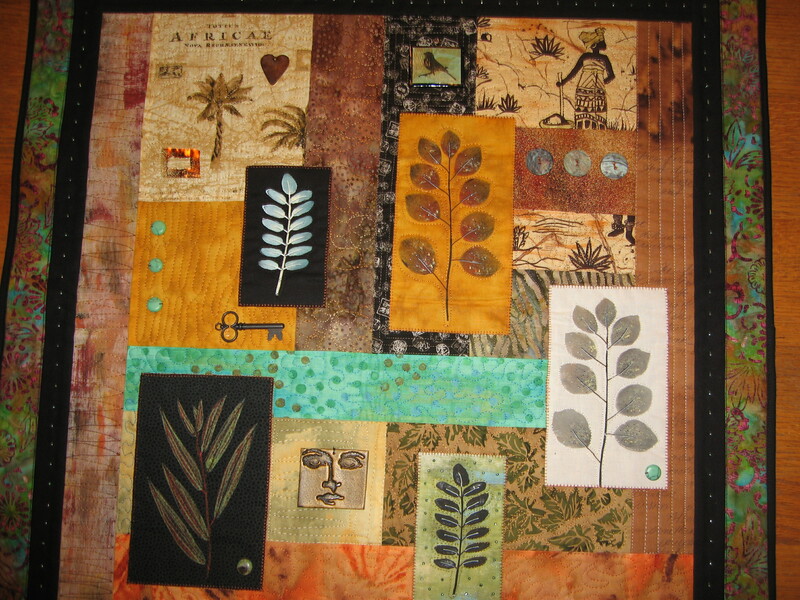 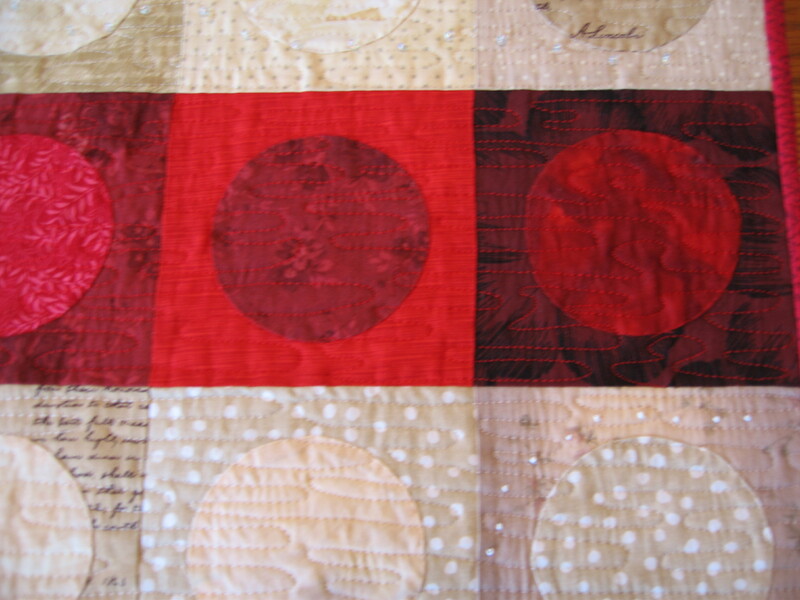 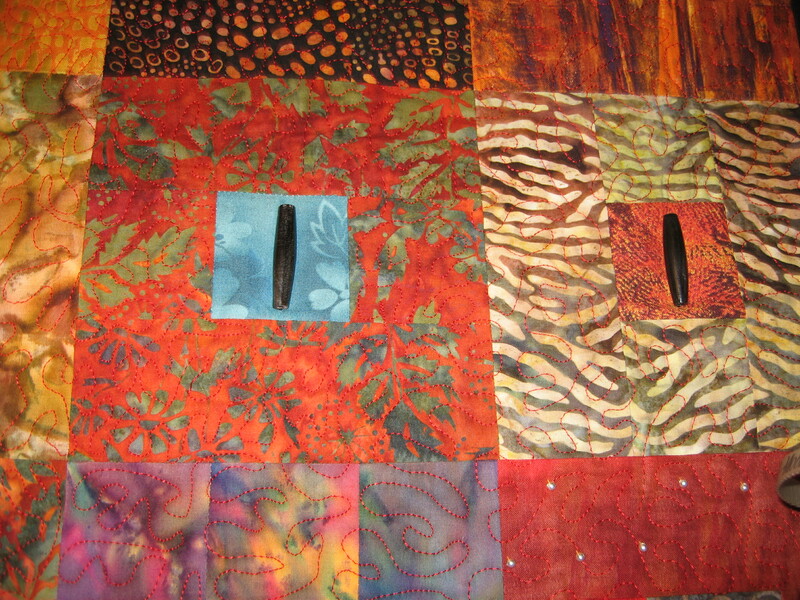 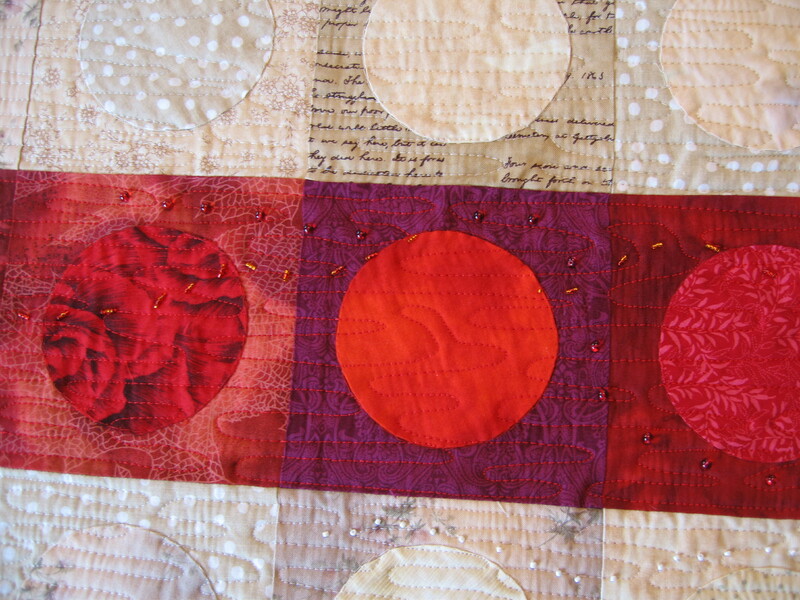 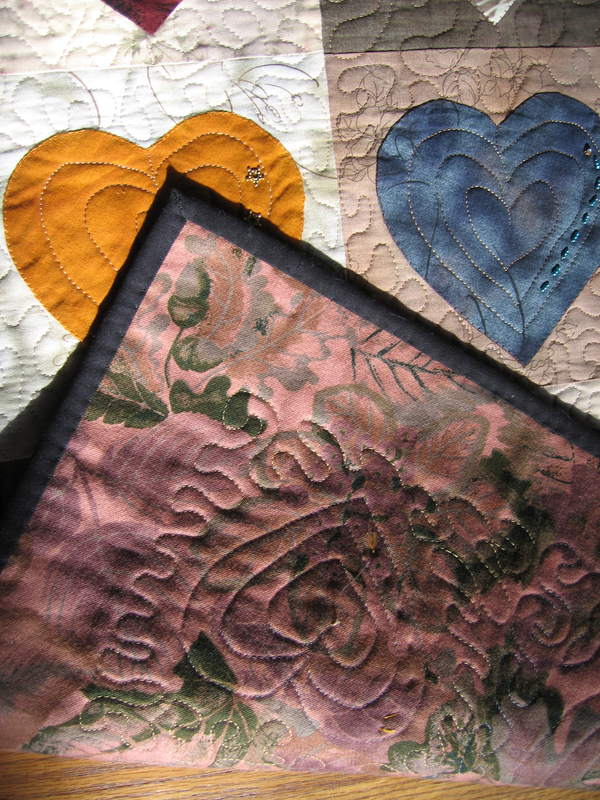 I use high quality materials in creating my one of a kind art quilts. 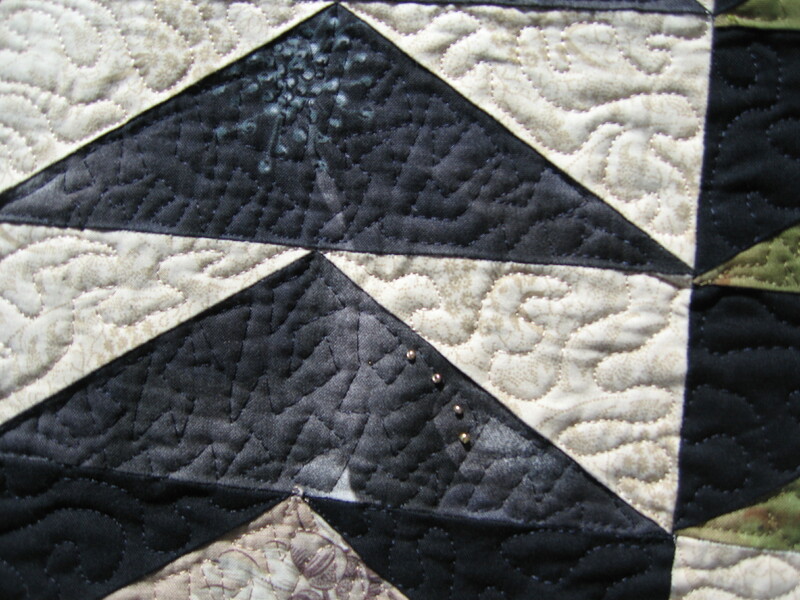 The quilt is backed with a beautiful heavy weight drapery fabric in a damask pattern that gives the quilt a luxurious weight that regular quilts don’t have. 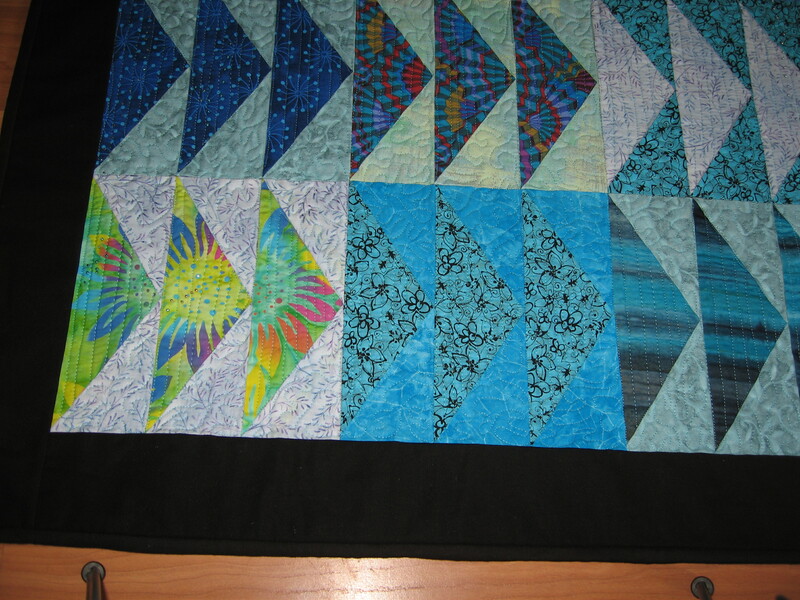 Nautica measures 24 1/4 X 24 1/4 inches. 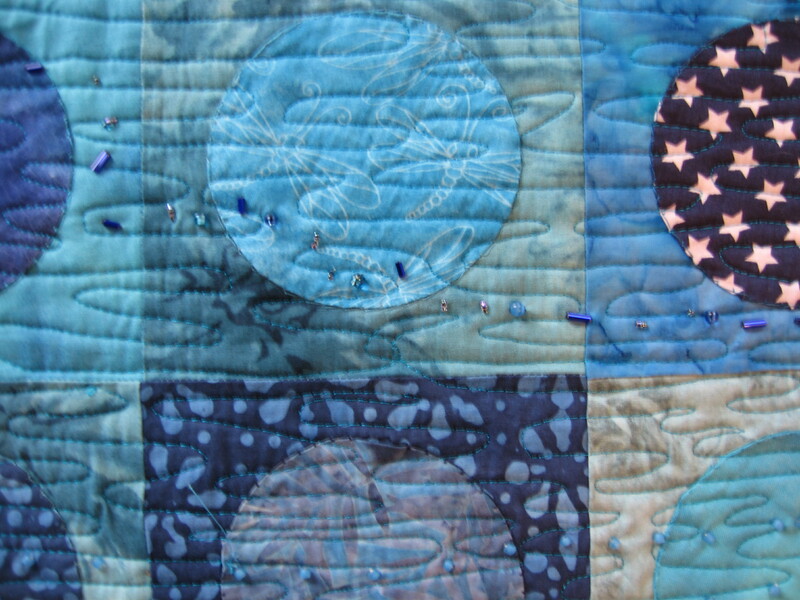 Neptune measures 32 1/4 X 36 inches. 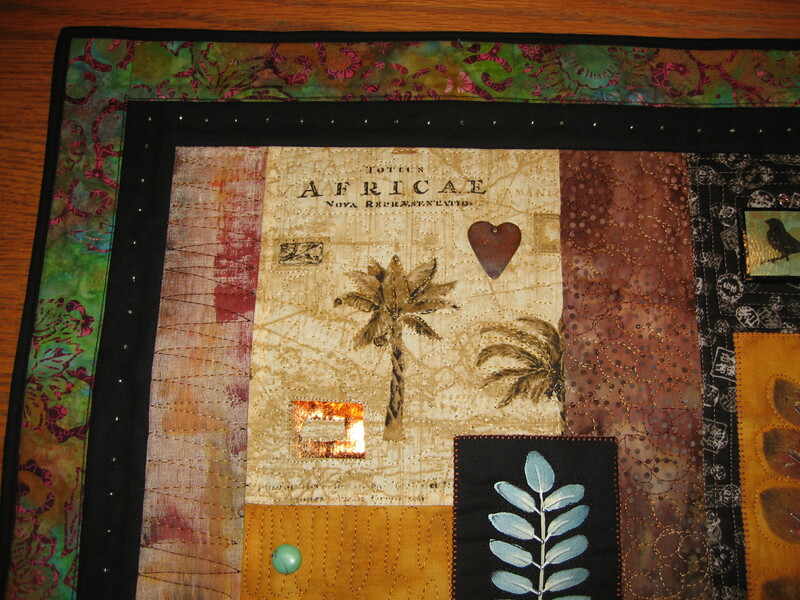 Africae measures 24 1/4 by 24 1/4. 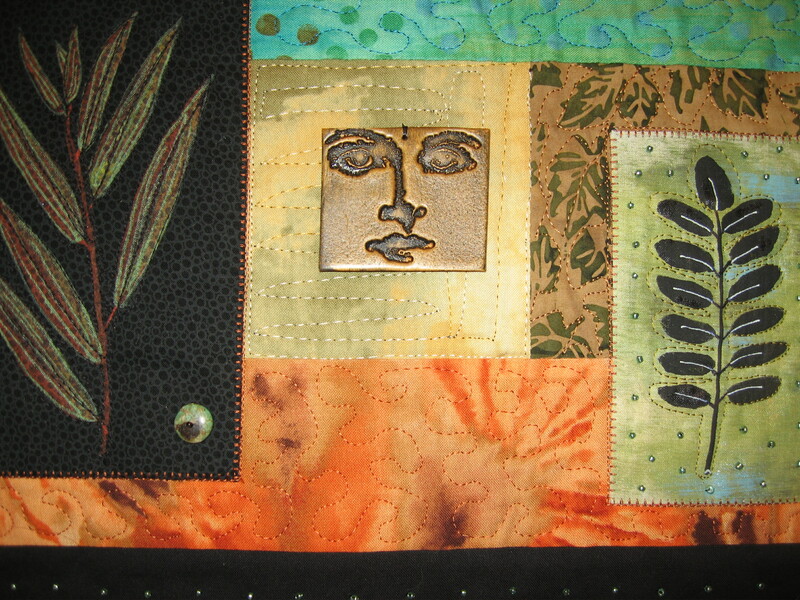 Burning Bush measures 32 1/2 by 36 inches.